Our grandson Matty wants to be a Ninja Turtle. 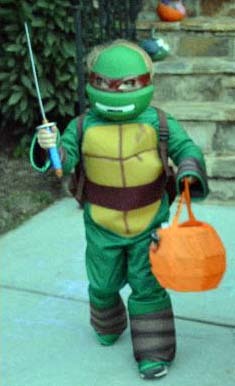 He doesn’t want to simply wear a Ninja Turtle costume; he wants to BE a Ninja Turtle. 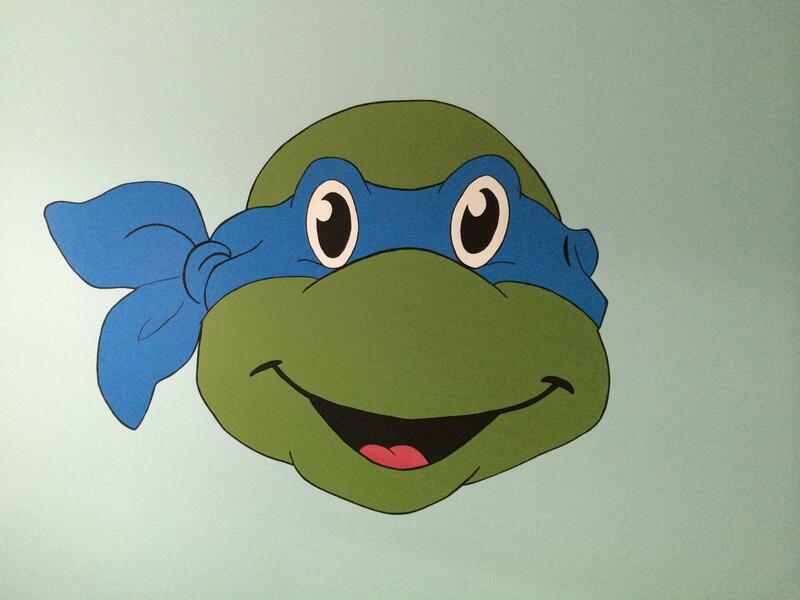 And why not – Ninja Turtles are heroes – they fight bad guys and never lose. They eat pizza every day! They live in sewers – how cool is that? A year or so ago, Matty wasn’t even aware that Ninja Turtles existed! He spent a weekend with us and was bored with our usual toys, so we brought Bobby’s 25-year-old Teenage Mutant Ninja Turtles out of storage and Matty was immediately fascinated with them. He was totally convinced this was the coolest toy since Elmo. 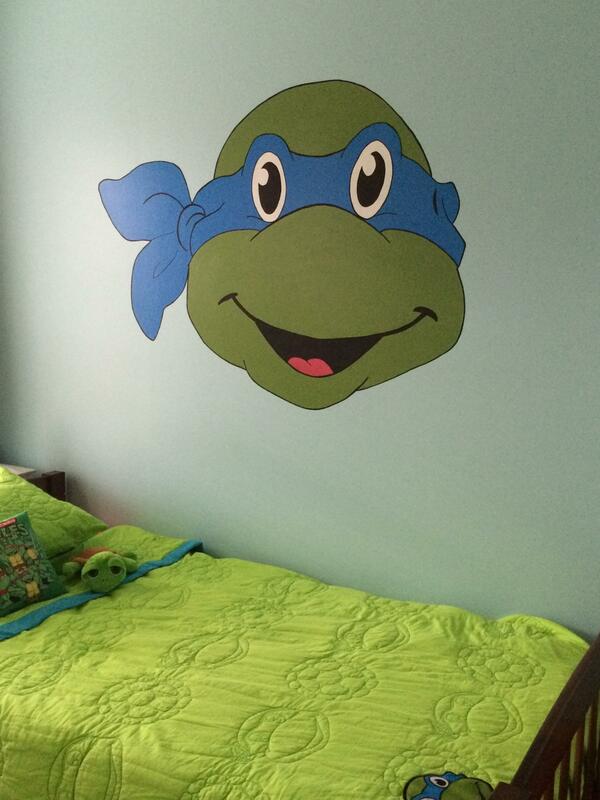 Since Matthew wants all-things-turtle these days, he received a turtle comforter set for Christmas and last week Brian painted his room and Nikki and I painted a huge turtle head on his wall. Matty goes to sleep every night assuming that he is safe and protected by his big turtle. And every morning Matty wakes up and checks to see if he is turning green. Every morning he is a little disappointed – well until last week – when I pointed out that the muscle beneath his thumb is a light bluish-green, and suggested that perhaps he IS turning green. Am I the worst Yaya ever? Matty is dedicated to the idea of superheroes, to the cause of good always defeating evil, and to the hope that his perception is reality. Are you? Are you committed to the Person of the Lord Jesus Christ, or to the idea of Jesus? If you are committed simply to the idea of Jesus, then you are committed to little more than a superhero. You may know the facts that Jesus is the Son of God, that he lived on earth, died on the cross, rose on the third day and ascended into heaven, but is that the extent of your interaction with Jesus? Are you friends with him? Or do you merely have an idea of who Jesus is, or who you want him to be? Does the idea of Jesus really make a difference in your life? The idea of Jesus has no power behind it because ideas have no power. The Person of Jesus has power that is imparted to you as you trust in him. He is real and he desires a relationship with you. Relationships exist between people, not between people and ideas. Is Jesus more than Superman? Spiderman? Captain America? Is he more than a superhero that you assume will hold your hand and usher you into heaven? Is he a real Person in your life? Do you have a relationship with God? Are you committed to the Person of Jesus, or to a favorite cause? There are lots of really good causes in the world, and lots of really good people who fight for their causes. But causes can’t save you from evil. Only the Person of Jesus can empower you and enable you to overcome evil. Jesus’ power was demonstrated at the cross when he defeated evil. That power is available to you when you are in a relationship with the Person of Jesus. Are you committed to the Person of Jesus or do you hope that your wishful thinking will become your reality? Do you hope that when you leave this life you will be in heaven? Wishful thinking cannot rescue you from hell. Christian hope is not wishful thinking. Christian hope is the blessed assurance that Jesus is the Son of God who saves us from sin and death. Jesus is real. He is not an idea, a cause, or a groundless hope. Saving faith is faith that is based on the fact that Jesus is a real Person with whom we can have a real relationship that saves us. Superhero or Savior? There is a difference, and it is a matter of eternal life or eternal death. To which are you committed?